Measuring polar ice from the air calls for the kind of precision flying made possible by GPS, but the usefulness of those satellites doesn’t end there. GPS information like latitude, longitude and altitude make up a crucial part of IceBridge’s instrument data, showing where each data point was collected, and ground-based GPS gives researchers a benchmark useful for checking instrument accuracy. One of IceBridge’s instruments, the Airborne Topographic Mapper (ATM), uses a laser altimeter to build what is essentially a topographic map of the surface. On each flight IceBridge will pass over the airport’s ramp to make sure that the laser altimeter, or LiDAR, is properly calibrated. Because the airport ramps are large, flat and obstruction free areas of known elevation they act as a sort of Rosetta stone, giving the ATM team something to compare their elevation measurements against. Having up-to-date elevation data for the entire ramp is the key to these ramp passes. And although IceBridge is an airborne mission this data is collected on the ground by a GPS antenna-equipped car. 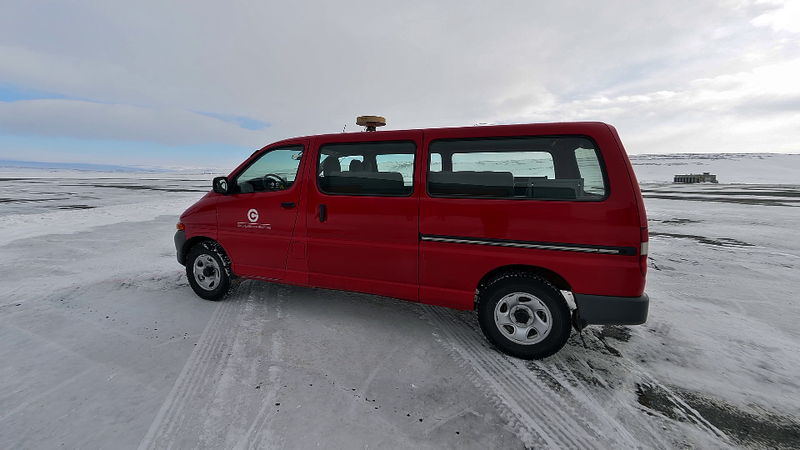 By driving this car in a grid pattern over the entire ramp and processing the GPS data in specialized software researchers are able to build an elevation map for the entire ramp. This map gives something researchers can use to check instrument readings, and it also reveals something that many people may not expect. Airport ramps may appear perfectly level and unchanging, but reality is different. First, the elevation of a ramp varies somewhat from one end to the other. “There is a relief of about 3 or 4 meters across the ramp,” said John Sonntag, ATM senior scientist. This relief gives an added benefit though because the slope gives more data to use for calibration. “If the survey shows a tilt of x degrees and the LiDAR shows a tilt of x plus 1, you know you need to make an adjustment,” Sonntag said. 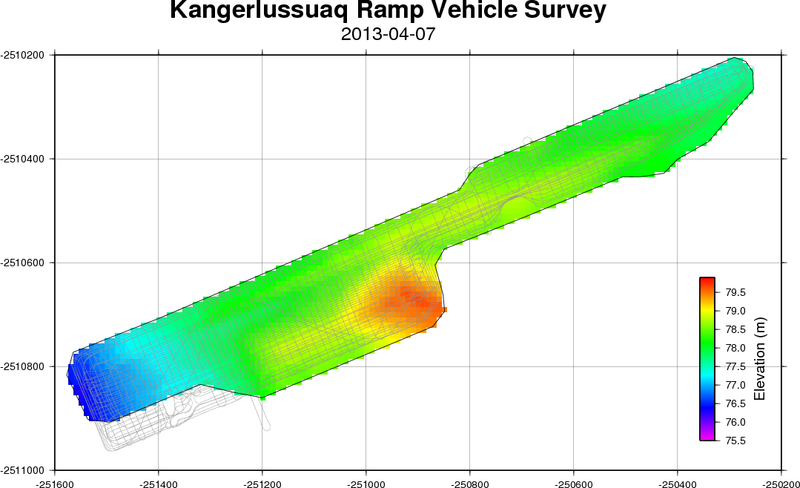 In addition to sloping, the ramps in Thule and Kangerlussuaq are changing slightly in elevation over time. Obviously any construction or repaving would change elevation slightly, but even the ground itself is rising. Although solid, Greenland’s bedrock has been pushed down and deformed over the years by the weight of the ice sheet. As Greenland’s ice sheet loses mass this downward force lessens and the bedrock starts rising—a process known as isostatic rebound. “In Thule, we’re seeing a rise of about two centimeters per year,” said Sonntag. Two centimeters may not seem like much, but even that small of a change could affect instrument accuracy. To avoid this IceBridge does ground surveys of the ramps every year or two. Thanks to these regular surveys and continual checking of instrument calibration IceBridge researchers are able to provide the scientific community with accurate measurements of changing polar ice.